this was a fabulous morning. i really appreciate my time alone nowadays. i got to walk over to the market and pick up some veg for christmas all by myself. 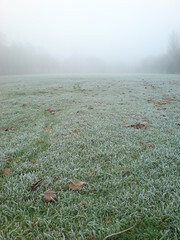 a 3 mile round trip with my ipod and ample photo opportunities thanks to the fog, totally uplifting. an interesting editing excercise, since i had half a dozen or so candidates. i think i picked the least obvious one, i like the textures and dodgy curvature.